Challenge a friend to checker-dropping fun with Connect 4! There are three ways to play, so choose your game. Original: Drop in you checkers and be the first to get 4 in a row to win. Pop Out: Get 4 in a row by popping a checker out instead of dropping one in. Pop 10: Pop checkers out of the grid. If your checker is part of a 4 in a row, you get to keep it. The first player to get 10 checkers wins. When you're done playing, tote your game around with a convenient carrying handle. The checkers store inside the grid so you're ready to play anytime! 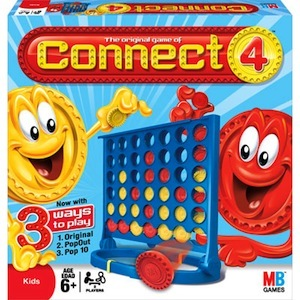 The original game of Connect 4 now with three fun ways to play: Original, Pop Out, and Pop 10! Includes 42 checkers, grid with checker catcher base/handle and instructions. Ages 5 and up.